Do you see repeating numbers on the clock, in addresses or in other coincidental ways that are too eerie to ignore? The universe just might be pinging you with a message. 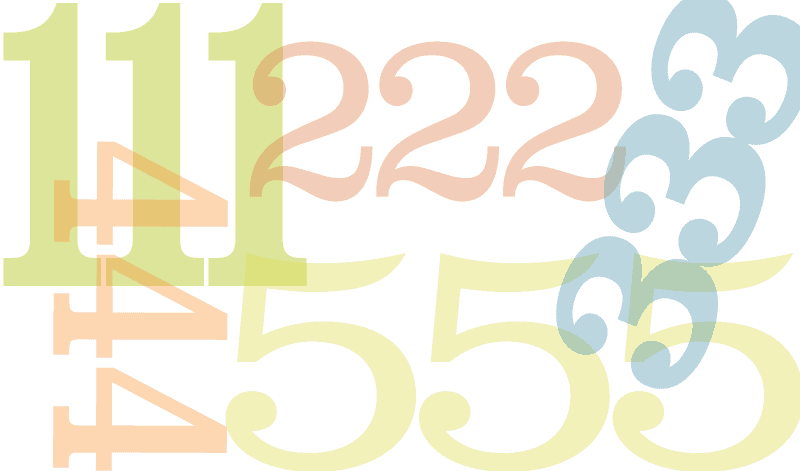 Here’s a guide to decoding these “master numbers” and what they’re telling you. Two is the number of partnership and relationships. When you see 2:22, pay attention to the people who are showing up in your world. You might be bumping into a soulmate, or a soul friend, someone who will play a significant role in your world. This could also be a signal to balance the give and take in your existing relationships. Is everything on an even keel? Are you contributing enough or are you slacking, or maybe over functioning? Take an honest inventory and tweak back to equilibrium. In astrology, the 2nd house of the zodiac rules our foundations, values and our creature comforts. In tarot, 2 is the High Priestess card of the major arcana. Hello, intuition! The appearance of 2:22 may be a reminder to stay true to yourself and voice your opinions with more oomph. So do a gut check when those 2’s appear. While we may fear rocking the boat by speaking up, authenticity is the cornerstone of any great relationship. Let people know what you stand for when you see 2:22. This could change everything, drawing likeminded souls your way and clearing the decks of people who are on a totally different wavelength. 2:22 says, trust your inner voice. 333: Align mind, body and soul. Three is the trinity number: mind, body, and soul. The appearance of 3:33 could be a confirmation that you’re hitting it on all three levels and really in the zone. You may feel insanely fulfilled by life when you start seeing those repeating 3’s. Or, it could be a little alert to check what’s out of balance. Have you been working hard at the expense of your sleep pattern and beloved yoga classes? Maybe you’ve been in “spiritual bypass” mode, spouting off recycled mantras and skipping over the real struggle that accompanies growth. Adjust accordingly and you’ll feel a sense of peace. In tarot, 3 represents The Empress: a fertile, abundant, sensual woman who loves to entertain and share with her realm. In numerology, 3 is the socialite. The third house of the zodiac governs communication, curiosity and mobility. This number pattern could be a wakeup call to get out more, pay attention to people, ask questions, and explore new terrain. Repeating 3’s may also be a sign that it’s time to have a party or shift into an abundant mindset rather than giving in to scarcity. Four is the number of home and family. In astrology, the fourth house governs the feminine realm so if you see 4:44, an important woman may have just come into your life. What are your loved ones up to? Your inner circle could use your attention. You may have just met someone who is a soul sister or a friend who will achieve ersatz family status in the days ahead. Your body is your soul’s home: are you honoring it with proper rest, exercise and nutrition? 4:44 could be a reminder to eat more live, organic greens and purge your environment of toxic stress…including people who you don’t really trust. Listen to your heart: are you getting the warm fuzzies or feeling panicked when you think about the people around you? This might be a wakeup call to protect your space and the loved ones who inhabit it. In tarot, 4 is The Emperor card, the wise, protective father figure, seated firmly on his throne. The appearance of 4s may also call you into protector-provider mode. What do you have to share with friends and family? How can you make life safer and more secure for your brood or entourage? Be a leader. Change is in the air when you see 5:55. Like a fast moving current or a gentle breeze, there is momentum to move in a new direction. In tarot, 5 is the card of The Hierophant, the bearer of traditional wisdom. Yet, in astrology, the fifth house is about creative self-expression, glamour and passion. We like to see 5:55 as a mix of both. In numerology 5’s are the people who are constantly in motion—and just as eager to sign up for a spiritual retreat as they are to be at the red-carpet opening of a blockbuster film. 5:55 is a wisdom wakeup call, but who says we have to suffer to be spiritual? We can be moved to tears by music, see the divine in a bright bouquet of flowers—or in the mirror when we take time to dress up and care for ourselves. But this is not about reckless abandon. Responsible indulgence can get the chi flowing from root chakra to crown. 5:55 may be a sign to unblock our energy with meditation, Reiki, acupuncture or a treatment from a holistic practitioner.